Although I don't have them in hand to take measurements, I copied some pictures off of the Internet and tried to reposition them for comparison. I couldn't find a Profile 88 picture with an actual side view as I could with the Morgan. I would really like to hear from anybody who has had both and actually compared them. I resized the Morgan picture to equal a mouthpiece that I had and noticed that the beak section was actually 1/8" shorter when looked at horizontally. I'm interested in what you think. Are they basically the same for a Brand 34 or 36 facing or is the Morgan actually flatter in that area? Also, which one is more comfortable in your opinion? Or, do they feel the same? p.s. Here's a clickable link to the Morgan website in which the side view of the mouthpiece is expandable. Well they are a shade bright and play well, but the bore is way too small. I don't have your model in front of me, but they seem to use the same molds. So we have a decent mouthpiece , actually better than a lot of mouthpieces on the market, but not probably not for your classical players as the baffle and the chamber is a bit shallow, producing a brighter sound. But for the community band players it's pretty good! There is also a problem with the bore which is too small. See the attachment. This reminds me of the Rico line of mouthpieces, which will play out of tune on a lot of notes or you will have dead notes that don't speak. 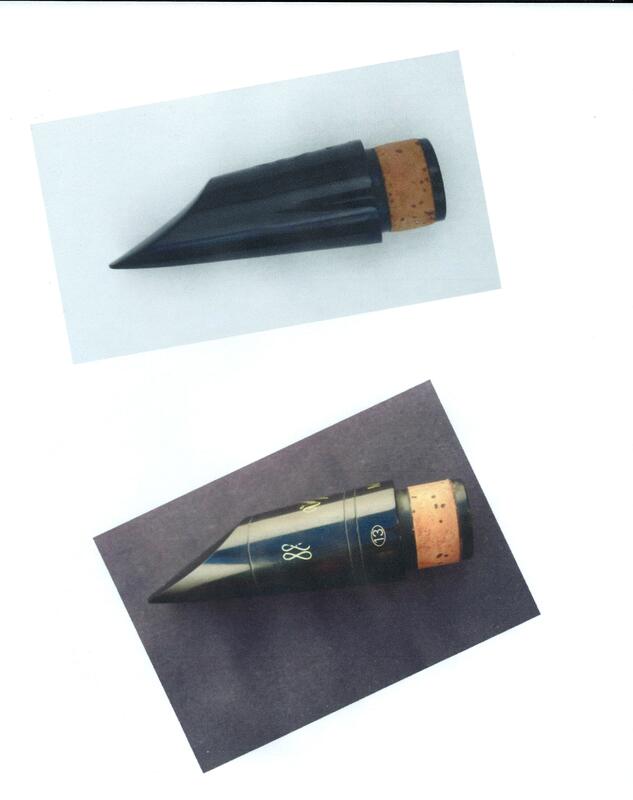 The black mark is where the better mouthpieces play in tune and line up well with the barrels of assorted instruments. As you can see the Morgan is pushing close to a 1/2 inch too short. This can be fixed of course as I have reamers to drill these out. But the baffle and chamber will still cause the sound to be bright. I do have tools to fix this as well, but at this stage why bother? It's 3 hours of work and you can buy a correct mouthpiece without going through all of this time and money. That Morgan Protone is a student mouthpiece from the Morgan workshop. I think Dan was asking about the real Ralph Morgan mouthpiece, made on a different blank and having the duckbill profile. Years back, when I was playing large bore clarinets, Ralph refaced a B&H 1010 mouthpiece for me. I asked him if he could re-profile the mouthpiece to approximate his duckbill shape, which I found very comfortable. He would not do it, as he was concerned that taking material off the mouthpiece could change the resonance and response of the mouthpiece for some notes. I have never played a Profile 88, so cannot offer an opinion as to the difference between the two. I think it's interesting to note that the term "duckbill" is not found on the Morgan clarinet mouthpiece website. It appears that the term "scoop beak" has taken it's place. Yes, I was referring to their professional mouthpieces. 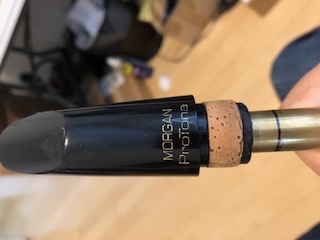 I played a Morgan Protone several decades ago and found it to be very resistant for me probably because of its 1.15mm tip opening at a medium facing. And, I'm still wondering if the "scoop beak" or the Profile 88 is actually more comfortable to play, or, maybe they're actually pretty close to each other as to embouchure comfort. 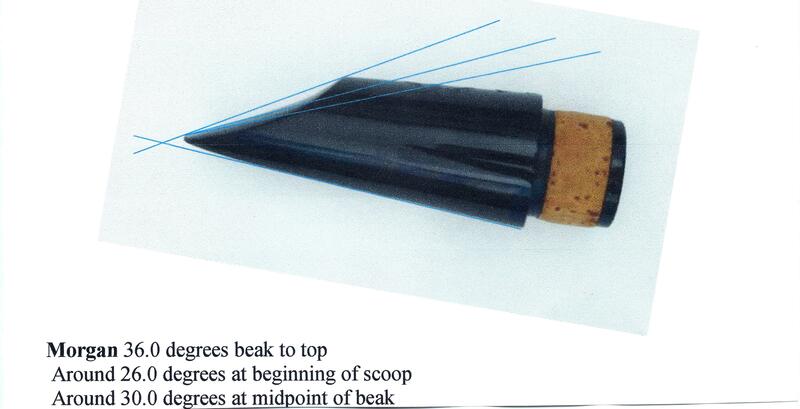 It would appear from my very unscientific measurement analysis that the Morgan RM series with the "scoop beak" is indeed at a very small angle at the beginning of the "scoop" and increases as the facing point increases along the beak. Even at the midpoint of the beak, however, the angular difference is still "around" 13 degrees lower than the Vandoren which is at a straight angle from tip of beak to the top. So, in my estimation, the Morgan "scoop beak" probably would be far more comfortable to play for those who prefer a lower beak angle. Please remember that all angular measurements are approximations made with a cut out protractor from the Internet. The Vandoren Profile 88 is fixed at approximately 39 degrees. I have an RM-10, RM-15, J-5 and J-7 Morgan and they all appear to be made from the same blank...my rough measurements (just using an adjustable 'square') agree with Dan's. Have you measured the facing lengths? I can't find any information about that. Here is the info that I have measured...most of these were original facings. Certainly the Morgans have not been refaced/modified...I got them new in the tubes. The Morgan scoop was smaller in the mouth than profile 88. It allowed you to play with this small mouth opening or you could also take more in your mouth than would be comfortable with a standard beak. The thickness of the material where your teeth go was thinner than a standard mouthpiece. This made for more freedom of blowing. This was highlighted in his Excalibur sax mouthpiece line. I have an Excalibur tenor piece with the large chamber...very nice, sort of a cross between a metal and a hard rubber profile. 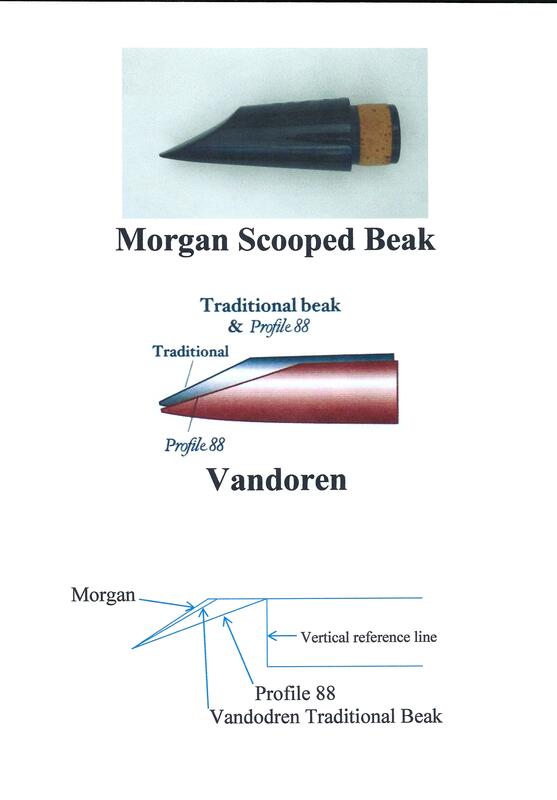 When I started, I didn't know that there were actually 4 different varieties of beaks: 1) Standard; 2) The Morgan "scoop"; 3) The Bay "Duckbill"; and 4) the Vandoren "Profile 88". I wonder how the Bay "Duckbill" compares to the Morgan "scoop" beak. I find it very interesting as to how difficult it is to find actual side pictures of the various beaks. I get the feeling that it's almost as if they don't want a person to see them from the side because then they might possibly make visual comparisons. The only exception I have found is the Morgan "scoop" beak mouthpiece. So far, all of the others are at various angles which makes it hard to compare the "bite" involved. I'd like to know the facing length of the RM-06 and will probably call the company today. If anybody knows it, please respond and let me know. I called and talked with Eric and he gave me the information that I needed.